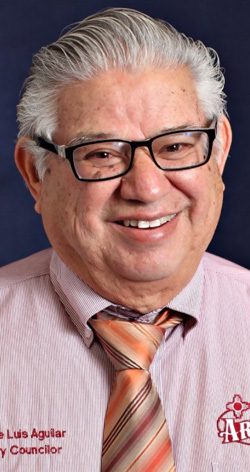 A rosary will be recited at 9 a.m. Thursday, Aug. 25, followed immediately by a celebration mass at Our Lady of Grace Catholic Church for Councilman José Luis Aguilar of Artesia. Aguilar, 72, passed into the arms of his Lord and Savior Thursday, Aug. 28, 2016, in Lubbock, Texas. Visitation will begin at 8 a.m. Thursday at Our Lady of Grace. Cremation will follow the services, per Aguilar’s wishes. Pallbearers will be Manuel Barragan, Manuel Moreno, Joe Salgado, Ernest Almanza, Gerard Escamilla, Frank Sanchez, Raul Rodriguez and Tom Navarrette. Preceding the services, the public is invited to join the Aguilar Family in the Church Hall for a meal hosted by the San José Society. José was born March 4, 1944, in Carlsbad and adopted by Luis Sosa Aguilar and Vencerlada Librada Riojas Aguilar of Artesia. José’s father, born in Terlingua, Texas, and his mother, born in Sabiasinte, Texas, both preceded him in death. José was a proud Artesian who grew up in this small community in the 1940s through the ‘60s with his brother, Manuel, and his close cousins, Socorro Ramirez of Albuquerque, Petra Navarrete of Carlsbad, Felipe Guerrero of Artesia, the late Eliodoro Guerrero of Carlsbad, and Orlando Guerrero of Centennial, Colo. Living in an industry of agriculture and petroleum, he chose the former and helped his father as a young teen raising livestock and farming fields. He soon became enamored with this life and joined the FFA in school to learn more. José knew this knowledge and skill could provide for him, but after graduating from Artesia High School in 1963, he began to long for something else, and his sights became focused elsewhere. José always possessed a love of country, and it was because of this he enlisted in the United States Army. He completed his basic training at Ft. Polk in Louisiana and later was honorably discharged from active duty and returned to the Army Reserve for the remainder of his service obligation. However, José’s inherit desire to serve did not end here. As a young man, José dreamed of being a police officer; unfortunately, due to his poor eyesight, he pursued other avenues to serve and that is when he became a Mountain Patrol volunteer. This sparked the beginning of a lifelong civic responsibility José always believed in – it is our duty and privilege to serve our fellow man. José headed off to college at Eastern New Mexico University in Portales. His love for math and numbers turned into a pursuit for a degree in accounting. This satisfied his meticulous nature, and he learned all he could. He soon became involved in the Newman Club, a place where those of Catholic faith could get together on campus, and participated whenever he could. His life was on track and his ambitions unfettered. Then in 1966, life presented him an opportunity that he never saw coming. Her name was Toni. José found himself once again in Carlsbad and was holding the honor of being a groomsman for a friend’s wedding. Standing across from him in the wedding party was a young bridesmaid by the name of Antonia “Toni” Vasquez. She was indescribably beautiful, and in his book, she outshone the bride herself. Being a man of charm and charisma, José did his best to woo the young lady, but Toni, being immune to such charms, would have none of it. José’s only chance would be in his persistence and determination, which luckily for him, he had in excess, and after a year, the two were finally married on Sept. 2, 1967. Shortly after getting married, that same year, José began working at Safeway grocery store, which he retired from 22 years later as produce manager. The following year, their first child, Ricardo Luis, was born, followed later by their daughter, Anna Maria, and one more son, Fermin Edwardo. With the birth of José’s two granddaughters, Gabby and Mia, he planted two maple trees to signify the blessing he felt at their healthy arrival into his life. He also planted maple trees on the land his three children inherited from their grandparents, Don Luis and Doña Lala. He took great care in his trees, nurturing and tending to them, and the trees that are uncommon in this arid environment now stand as a permanent legacy to the love of his children and grandchildren. José and his wife also cared for two young boys that he loved dearly, Dale and Axel. The 1970s brought change to the nation, and to Aguilar, it prompted a new passion: politics. The city was changing and many in the labor force were feeling only the negative effects of this change, and soon after, the labor strikes began. The city felt these troubles and José became an advocate for those who had no voice. He felt strongly about social injustice and felt that everyone, and especially the least of these, should have an equal right to work and an equal right to earning a sustainable living. He raised the alarm and organized people into productive strikes for better wages and represented the underserved. José was later elected to the city council of Artesia, where he served for several terms, even holding office until his passing. José fought for redistricting and took the fight all the way to the Supreme Court in order to effect change in the 1980s. Outside of his family, holding a public office was his truest and dearest passion. He loved his community and gave all to those he served. Survivors include his true love and wife, Toni Aguilar, of Artesia; children Ricardo “Ric” Aguilar and daughter-in-law Shannon, Anna Maria Aguilar, and Fermin Edwardo Aguilar, all of Albuquerque; granddaughters Gabrielle Marie and Mia Nicole Aguilar; two brothers-in-law; four sisters-in-law; and many nieces, nephews and cousins. He was preceded in death by his parents, Luis and Librada Aguilar, and a brother, Manuel Aguilar. In lieu of flowers, the family suggests memorial donations be made to the St. Vincent de Paul Food Bank of Artesia, 603 S. Roselawn Ave.; St. Jude’s Children’s Hospital, 332 N. Lauderdale, Memphis, TN, 38105; or the American Heart Association, 2201 San Pedro Dr. NE, Bldg. 2102, Albuquerque, NM, 87110. Arrangements are under the direction of Ballard Funeral Home and Crematory of Roswell. Condolences may be expressed online at www.ballardfuneralhome.com.